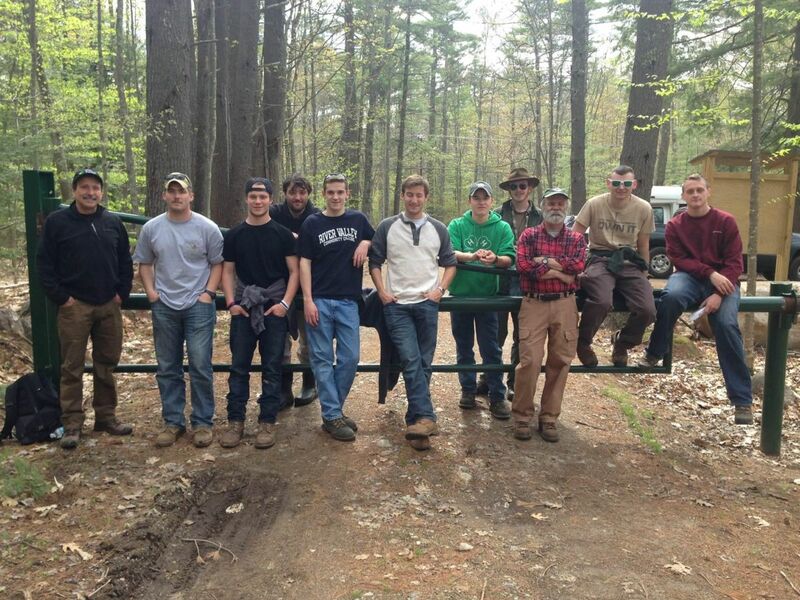 UNH Thompson School Forest Technology Students visiting the Branch Hill Farm Demonstration Forest on May 11th . Branch Hill Farm Forester, Charlie Moreno pictured on the left and Professor Matt Chagnon is third from the right. Is it really possible to run on snowshoes in snow? The answer is a resounding ‘yes’ and the proof will be on Saturday, January 21 at Branch Hill Farm, the new site of the 3rd annual Moose Mountain RunAround snowshoe race. The race is a benefit for Moose Mountains Regional Greenways (MMRG) and enthusiastic onlookers are encouraged to come cheer on the participants. Volunteers are also needed. 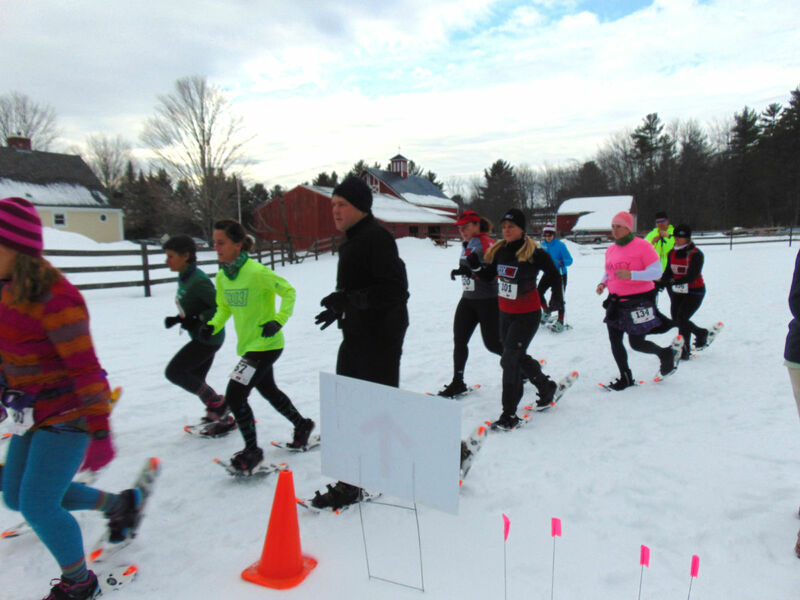 Snowshoe racers will traverse 4 to 5 miles of open fields, snowmobile trails and single track around the 3,000-acre Branch Hill Farm at 307 Applebee Road, Milton Mills, NH. The snowshoe race will begin at 10 am. The suggested donation for the race is $20 in advance and $25 on the race day. Dion Snowshoes will have loaner snowshoes available for an additional $5 on a first come first serve basis. Racers will be eligible for prizes in standard categories. Registered walkers are also welcome to enjoy the trails. To pre-register, reserve snowshoes, or for more info, go to http://trailrnr.wix.com/moose-mountain-ss or call 603-520-8533. Volunteers are needed in advance to help prepare the course and on the day of the race to help with set-up and tear down, serving food, parking, directing racers along the course, working the finish line, photography, and compiling results. All registrants and volunteers receive refreshments and a custom buff. To volunteer, call MMRG Education Coordinator, Kari Lygren at 603-978-7125 or email info@mmrg.info. The race has been created as a fundraiser for Moose Mountains Regional Greenways and takes advantage of the excellent opportunities for outdoor recreation in this region. Protecting such opportunities through conserving open space is part of the mission of MMRG, a non-profit land trust serving the towns of Wolfeboro, New Durham, Brookfield, Wakefield, Milton, Middleton and Farmington; see www.mmrg.info. MMRG is grateful to Ilex Wetlands Consultants and Wolfeboro Oil for sponsoring the event and Beveridge’s Beer and Soap, Nordic Skier, and The Works Café for donating prizes and food. Branch Hill Farm/the Carl Siemon Family Charitable Trust works to protect open space and working forests and to educate the public about sound forestry, conservation and agricultural practices; see www.branchhillfarm.org. The Siemon Family appreciates this expression of thanks from a resident of Milton, NH, recently posted on Moose Mountains Regional Greenways Facebook page. Our family is always happy to hear from folks who enjoy recreating on our conserved properties. New Hampshire Fish and Game has just reminded the public of the need to thank private landowners for public access to their lands for recreational opportunities. Without their generosity, the Granite State would indeed be a far poorer place to live. For my wife and me, access to Branch Hill Farm is especially important – it is essential for making Milton livable for us. So thank you, Cynthia Siemon Wyatt and the rest of your family, for this marvelous gift that your father established and you manage so well! Thank you, and please accept our warmest wishes to you and your family for a happy holiday season! 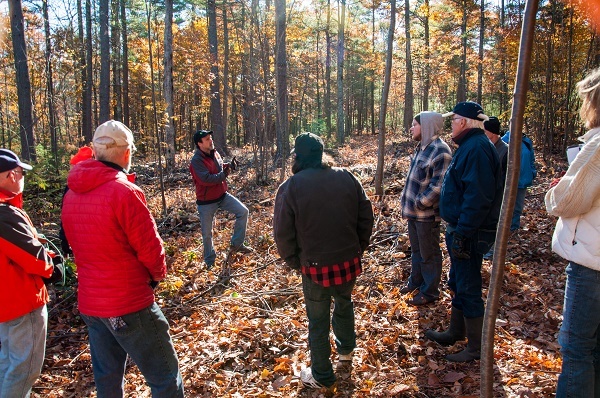 A unique outdoor workshop demonstrating four types of harvesting systems in a sustainably managed forest attracted more than 50 participants to Branch River Woodlands in Milton on a crisp November Friday morning. The free workshop was presented by the Carl Siemon Family Charitable Trust/Branch Hill Farm (CSFCT/BHF), with support from Moose Mountains Regional Greenways. 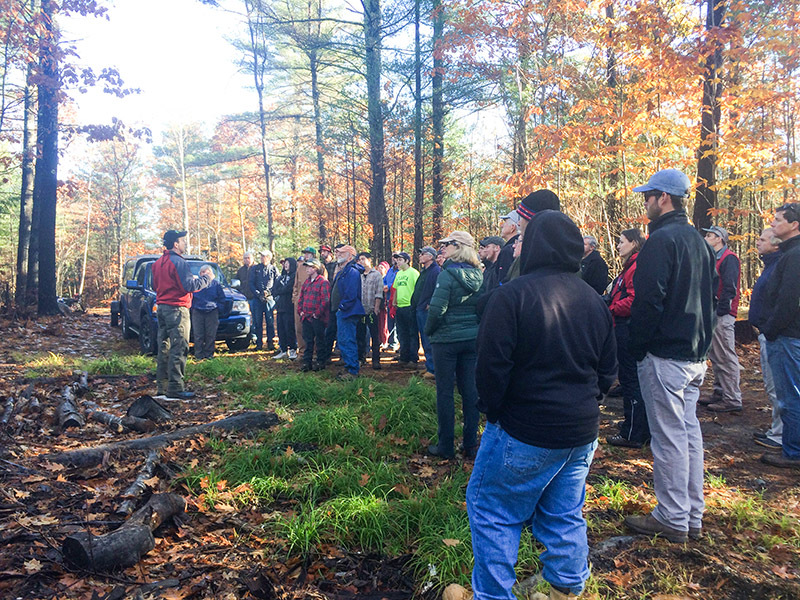 It was led by BHF consulting forester Charlie Moreno and his colleague Greg Jordan, both of Moreno Forestry Associates, an ecologically-based forest management service in Strafford, NH. Cynthia Wyatt, Managing Trustee of CSFCT/BHF, opened the workshop with the story of how her father Carl Siemon grew Branch Hill Farm into a 3,000-acre Tree Farm, with 100 acres of productive hayfields and 2900 acres of sustainably managed forest land. She stressed the importance of the BHF conserved properties for clean air, water, wildlife, and recreation as well as their important contributions to the local and regional forest industry, with its beneficial ripple effects of supporting multiple jobs and renewable forest products. 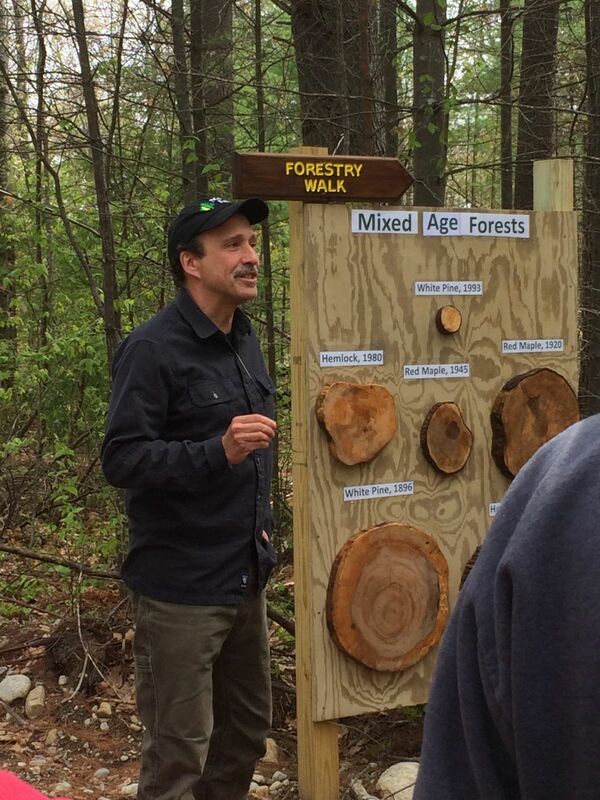 Standing next to a future high value veneer tree, Moreno enumerated the various forest products: high value timber for furniture and building materials; lower value products including chip wood used in power plants in northern New England, pulp for paper, and firewood for residential use. Markets for all products are essential for an economically viable woodlot. A healthy, sustainably-managed forest also requires matching the appropriate logging system to the forest situation and making use of a professional forester to envision and apply long-term silvicultural management. Moreno went on to explain the importance of natural regeneration, which is the self-planting of forests. Techniques such as timber stand improvement (TSI) help establish natural regeneration and future forest growth that is favorable for wildlife as well as economic viability. Using a micro-harvesting system, TSI removes invasive exotics, unhealthy trees, and species with low economic value that shade out valuable trees like oak and pine. Moreno recommends managing for a diversity of tree species and tree ages, from seedlings and saplings to mid-aged trees and older forest. Following this introduction, participants made their way to different sites in the Branch River Woodlands to observe demonstrations of the various timber harvesting systems: Micro-harvesting for TSI; Conventional harvesting using the traditional chain saw and skidder method; and contemporary mechanized harvesting systems including Cut-to-Length (CTL), and Biomass harvesting (whole-tree chipping). Logger Larry Hersom, with 40 years of experience, demonstrated conventional harvesting using a small skidder, chain saw and full safety gear. After skillfully felling a tree, while avoiding damage to young growth and surrounding trees, he prepared the tree and carefully dragged it to a staging area. Hersom recommends cutting tall trees in half, when possible, before skidding them, to minimize damage to the forest. Hersom also showed micro-harvesting techniques in a young pole-sized hardwood stand. Using a four wheeler equipped with a winch, he safely and efficiently downed a ‘hung-up’ tree, a potentially hazardous situation that frequently occurs when thinning dense young growth. The high-tech cut-to-length mechanized harvesting system, showcased by William Day Jr. and Sons, Inc., has the operator sitting in the cab of the mechanical harvester, using a computer-aided dashboard to control the machine with its ‘dangle-head’ cutter, an extremely versatile piece of equipment. After using the harvester to de-limb a tree and cut it to length at the stump, a mechanical forwarder lifts the trunk sections and carries them to the staging area. As in the conventional technique, the timber has a variety of uses. 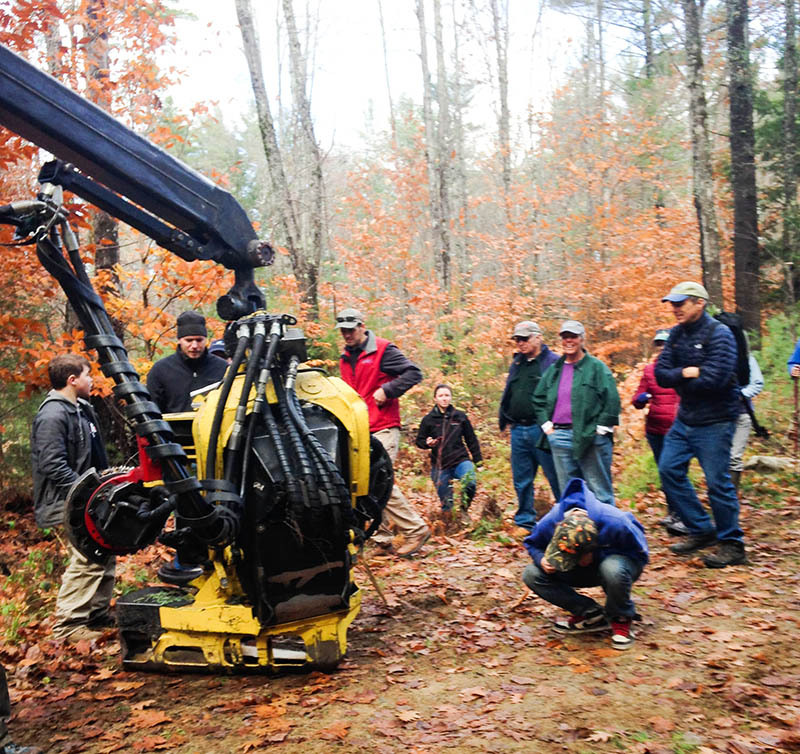 With nearly 20 years of experience, operator Bill Derubo commented that it not only takes a long time to learn how to expertly manage the equipment, but also to effectively work around the young growth and future valuable trees that foresters are trying to grow. Biomass harvesting is similarly high-tech, using a high speed rotary head on the harvester, a grapple skidder, a yard crane, slasher, and a large chipper. This system was also demonstrated by William Day Jr. and Sons, but unlike CTL, the trees are gathered in a central landing, where they are processed and sorted into their highest value products including logs, pulpwood, and chips. Operator Mike Chagnon remarked that a good crew requires skilled operators, good communications, and teamwork. 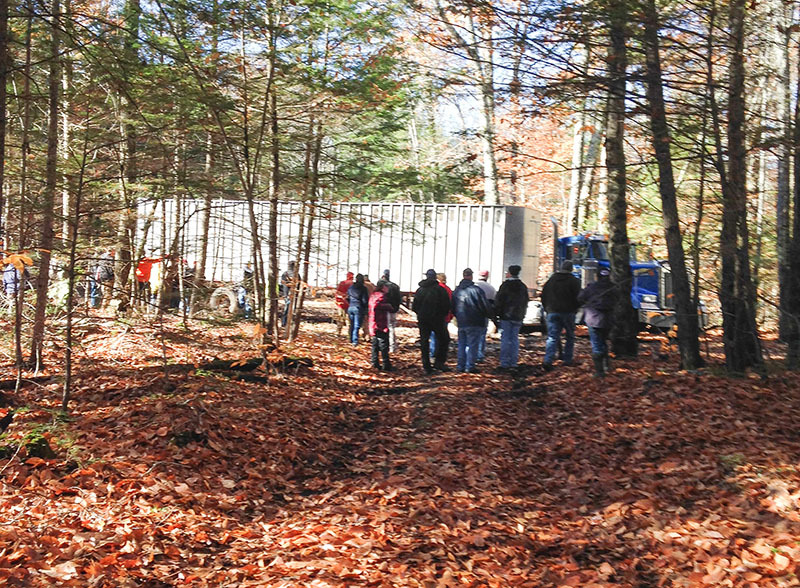 Biomass works well for land-clearing projects such as converting forests to fieldland, or to create shrub land for wildlife, and is also appropriate for many forest restoration projects. 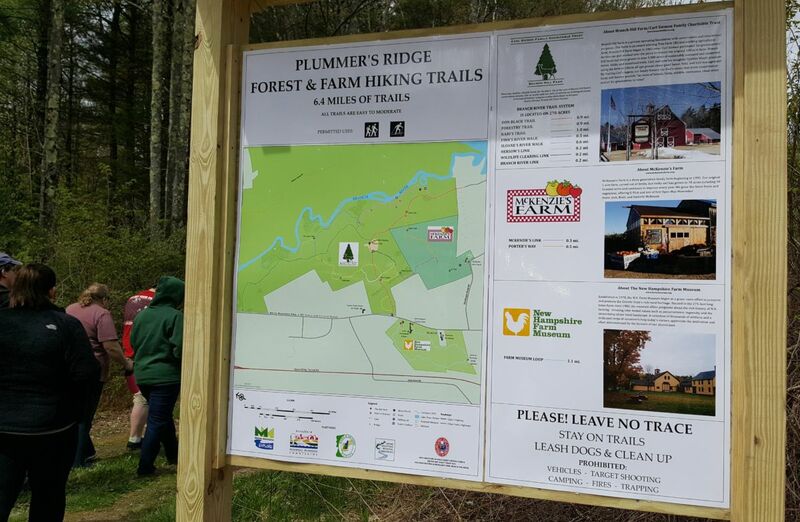 Branch Hill Farm/the Carl Siemon Family Charitable Trust works to protect open space and working forests and to educate the public about sound forestry, conservation and agricultural practices. BHF provides free forestry workshops in order to educate the public on the direct and indirect benefits from sound forestry practices. For more information, visit www.branchillfarm.org. MMRG, a non-profit land trust, works to conserve and connect important water resources, farm and forest lands, wildlife habitats, and recreational land in Brookfield, Farmington, Middleton, Milton, New Durham, Wakefield, and Wolfeboro. Throughout the year, MMRG offers many educational opportunities to inform all ages about the benefits of our region’s natural resources. For more information about MMRG, visit www.mmrg.info. 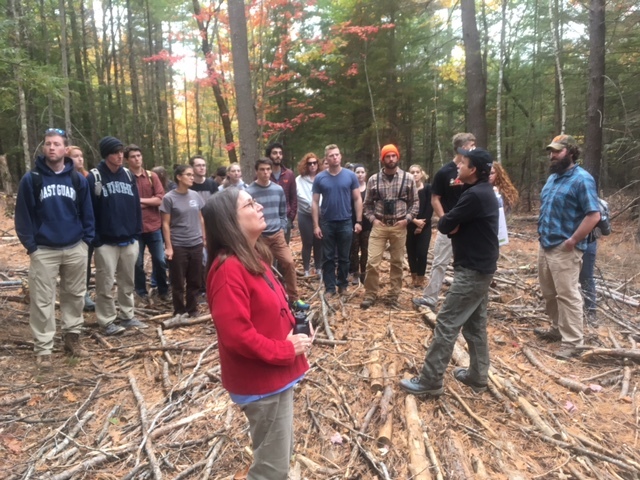 A University of New Hampshire wildlife habitat class visited Branch Hill Tree Farm with their professor, UNH Cooperative Extension’s wildlife specialist Matt Tarr, and with consulting forester Charlie Moreno and Extension Forester Karen Bennett. 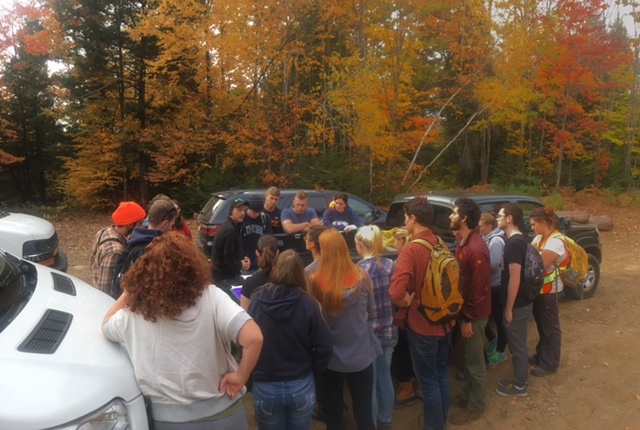 The students saw an active logging job and learned how wildlife habitat is part of a landowner’s management objectives and can be incorporated with forest regeneration and improvement. This article originally ran in the Baysider. MILTON — A unique outdoor workshop is planned for Friday morning, Nov. 4, where three forms of logging will be demonstrated on a sustainably managed forest. The workshop is free and open to the public and will be held at the Branch River Woodlands in Milton from 9:30 a.m. to 12 p.m. It is co-sponsored by Moose Mountain Regional Greenways (MMRG) and Branch Hill Farm/the Carl Siemon Family Charitable Trust (BHF/CSFCT). Woodlot owners, students, conservationists and anyone interested in understanding the timber harvest practices they observe in local forests, or in seeing new possibilities for forest improvement, are invited to watch both high-tech and ‘micro’ equipment in action. Consulting forester Charlie Moreno will discuss the various timber harvest systems and the associated forestry, with on-site demonstrations by Brent Day of Wm. Day and Sons, Inc., showcasing in-progress cut-to-length and biomass harvest operations, and Larry Hersom of Hersom Logging, showing conventional logging and micro-harvesting techniques. Moreno will answer these questions and more, as attendees watch the crews at work. 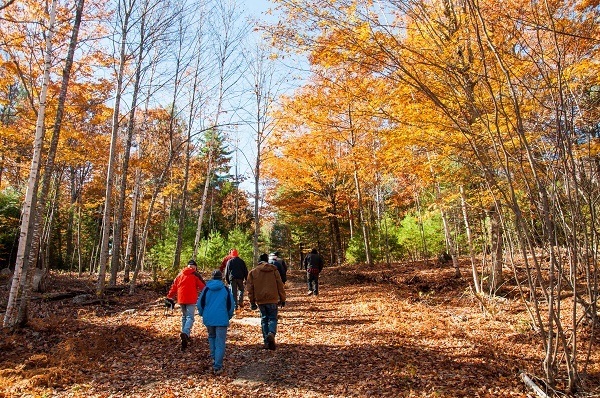 The outing will encompass about 2.5 miles of walking on trails and forest roads. For more directions and to pre-register, please call MMRG’s Education Coordinator Kari Lygren at 978-7125 or e-mail info@mmrg.info. MMRG, a non-profit land trust, works to conserve and connect important water resources, farm and forest lands, wildlife habitats and recreational land in Brookfield, Farmington, Middleton, Milton, New Durham, Wakefield and Wolfeboro. Throughout the year, MMRG offers many educational opportunities to inform all ages about the benefits of our region’s natural resources. For more information about MMRG, visit www.mmrg.info. Branch Hill Farm/the Carl Siemon Family Charitable Trust works to protect open space and working forests and to educate the public about sound forestry, conservation and agricultural practices, see www.branchillfarm.org. To register, email info@mmrg.info or call Kari Lygren at 603-978-7125. Demonstrations of conventional logging and ‘micro’ harvesting techniques by Larry Hersom of Hersom Logging and of cut-to-length and biomass harvest operations by Brent Day of Wm. Day & Sons, Inc.
About 2-1/2 miles of walking on trails and forest roads. Forestry workshop photos by Kate Wilcox.